Grist brings many years' experience and knowledge to his new role and will be responsible for sales, marketing and strategy. He will be supported on Electronic Security by Dave Bonci; and on Manned Security by Sean Titheridge, who also joined Trigion earlier this month. REMEMBER! 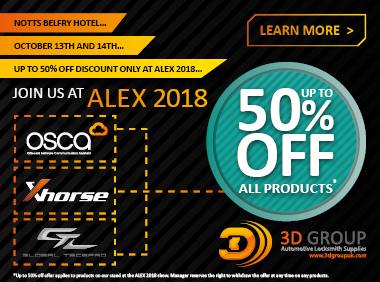 IT IS ALEX THIS WEEKEND AT THE BELFRY HOTEL NOTTINGHAM - THE ONLY EXHIBITION FOR THOSE SERIOUS ABOUT AUTO LOCKSMITHING - WWW.ALEXPO.CO.UK FOR FULL DETAILS. With over 19 years of experience in the security industry - having entered straight out of school - the 37-year-old has spent the last 10 years working as a regional investigator for the Security Industry Authority (SIA), where he also completed a seven-month stint acting as regional investigation manager for their compliance and investigation department during 2012/13.